The Christian Louboutin Almeria Wedge is the perfect espadrille-inspired shoe for summer. Height, style and comfort! They retail for $535 at Barney's New York. 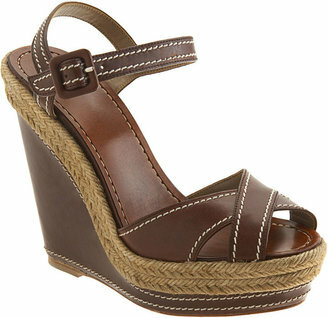 Get the look for less with this spot-on lookalike called the Jessica Simpson Heathery , currently $89 at piperlime.com. Bummer! I was going to buy these (seriously ... directly from your post - haha), but they're out of my size (5.5) on both Zappos and Piperlime. Darn. I'll definitely keeping my eye out for another lookalike!